Why do I love the folded chips so much? I guess they are extra crunchy. Slightly burned? My son even knows if he comes across one to give it to me to see me smile. But no brown M & M’s! The true story of the M&Ms is even cooler than the myth of spoiled rock stars. 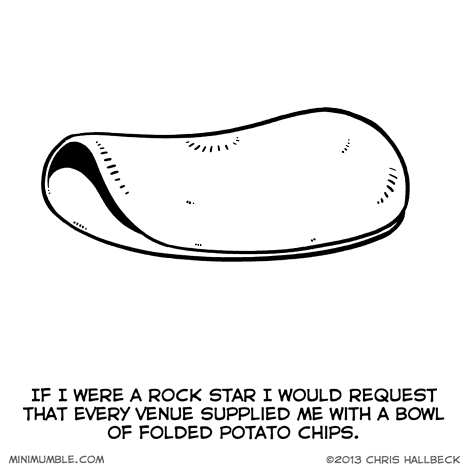 Folded potato chips would serve the same purpose nicely. Ooh! Folded chips and a can of spray cheese to fill them with! omg, I’m not the only one! In Australia, we sometimes call them “wish chips” … when you bite into one.. you get to make a wish. I didn’t realize Australia had such strict wishing regulations. Do you get fined if you make a wish on a normal chip? They’re wish chips here in Canada, too…well, at least Ottawa. THIS. I wonder how many pags you’d have to pop to gather a bug full of half-popped kernels. What IS it about the folded chips?! They are the best! Your comics are awesome, by the way. Glad I found you!